As you can see in the screenshot below, there are four fields on the first page of the Add Funds By Wire section. From, Account, Amount, and Coupon (Optional). The From field has a dropdown menu which lists any bank accounts you have added to your Paxum account. From this dropdown menu select the bank from which you will be sending funds. 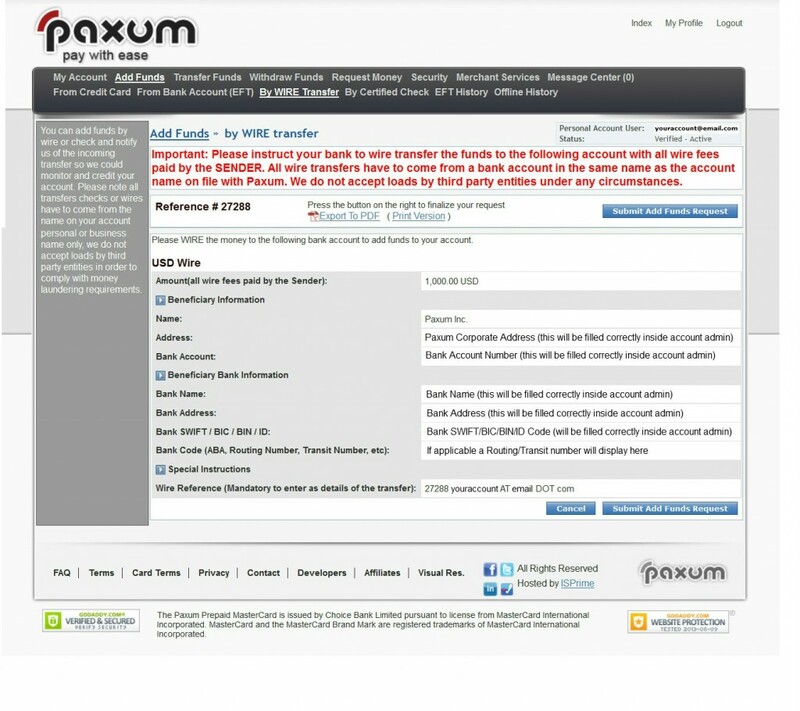 The Account field indicates the Paxum Checking Account options. If you have added alternative currency accounts to your Paxum account then they will be listed here. 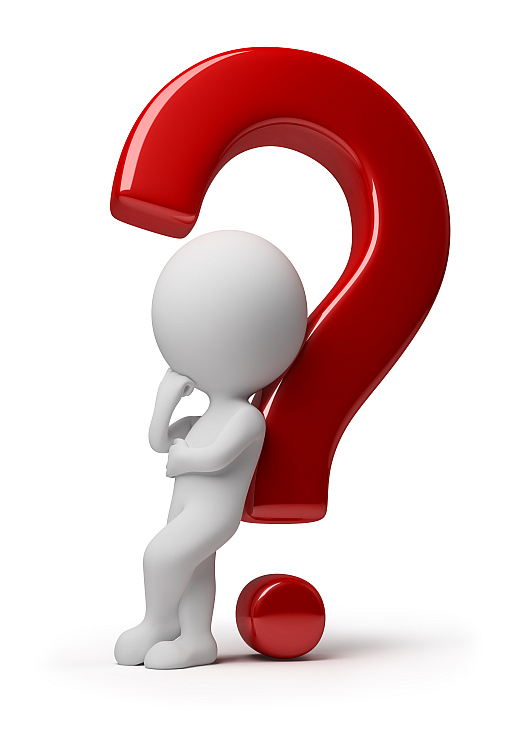 Select the Account where you wish to have the funds deposited. For example, if you are sending USD then select USD, if you are sending EUR then select EUR, etc. The Amount field is how much you will be sending to fund your account. Input the amount here and make sure the currency matches your selected accounts (ie, if you are funding your USD account it should show USD, if you are funding your EUR account it should show EUR). The Coupon (Optional) field is for if you have received a coupon from Paxum in relation to Add Funds By Wire. If you have a coupon code then this is where you should input that information. Next, you need to click the blue CONTINUE button in the bottom right corner. After you click Continue you will be taken to the next page which displays the most up-to-date wire information for you to send funds to us. You can either export this information to PDF, Print directly from the page, or copy/paste the information into a document. 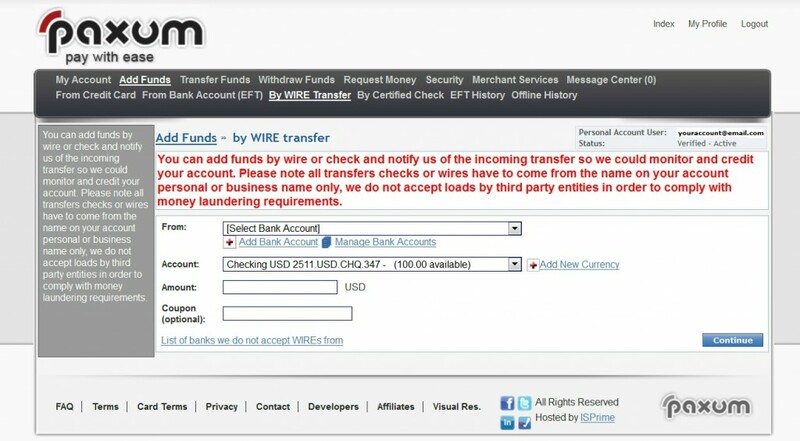 It is crucial that you make a note of the wire information at this stage of your Add Funds By Wire request as it will no longer be accessible after you finalize the transaction. Make sure you note that the information contained in the SPECIAL INSTRUCTIONS (at the bottom of the wire information page) is MANDATORY to be included when you send the wire to us. This helps us to identify and deposit your wire as quickly as possible. If you do not provide that information to us your incoming wire may be subject to delays. After you have made a note of the wire information in some way, it is imperative that you finalize the transaction for the pending wire to be noted in your account. Click the blue SUBMIT ADD FUNDS REQUEST button in the bottom right corner of the page to do this. Once submitted you should receive an email confirmation of your pending wire. the wire to us through your bank.